Artificial Intelligence is growing rapidly. According to Bank of America Merrill Lynch, revenue in AI-related technologies is predicted to grow from roughly $2 billion in 2015 to about $127 billion by 2025. Much of this growth is in ‘deep learning’, where machines analyse huge datasets to learn specific behaviours. This allows computers to recognize patterns and “learn” new actions without being explicitly programmed. These advances are expected to have massive social consequences, which could ultimately displace jobs and require the redesign of laws and regulations. In the creative economy, applications of AI are already starting to emerge. What can creative AI do today? AI is helping creators more effectively match content with audiences. Algorithms based on neural networks learn and classify a user’s preferences – from movies streamed on Netflix, music listened to on Spotify or products purchased on Amazon – to recommend content tailored to a specific user. AI aids production by simplifying or automating tasks. In advertising, it is used to contextualize social media conversations to understand how consumers feel about products. Services such as Amper or Jukedeck compose music with AI, enabling small-scale creators to use high-quality music for their podcasts, videos and games at low cost. Automated mastering software such as Landr provides near-studio-quality processing and rendering for as low as $50 per year. AI is also generating its own content with little or no human supervision. AI that generates text is widespread in journalism and used by publishers to automate some news production. The Associated Press has used AI to free up around 20% of reporters’ time while increasing output tenfold. The Washington Post developed a tool to cover sports and political news, producing about 70 articles a month in its first year. In music, AI has produced instrumental sounds that humans have never heard before. AI has also generated sophisticated images from photography. In fashion, researchers have generated new designs using AI. And in film, scripts have been written, complete with stage instructions, for a science fiction movie. Many of these applications still require human intervention or oversight, whether it’s in editing or quality-control, or to polish and master the rough templates that AI generates. But before too long, AI could begin to supersede humans entirely. What could creative AI do in the future? AI will likely have the most profound social consequences when labour is fully automated – when, for any occupation, it can carry out the task better and more cheaply than a human being. Researchers believe there is a 50% chance that AI will outperform humans in all tasks in 45 years. AI has started to prove itself in multiple creative domains. Recently, AI has authored a poem that was accepted by a literary journal without the judges knowing it was written by a machine; was crowned king of quiz show Jeopardy; passed the first round of a writing prize; and generated a movie trailer. Within just a couple of years, AI is expected to play well enough to win the World Series of Poker. AI can already play – and beat – professional card players at Texas Hold’em. Experts believe it won’t take too long before a machine is crowned champion. In under 10 years, AI is expected to be able to write an essay for a high-school history class that will both receive high grades and fool plagiarism detectors. As mentioned above, AI is already in used music production in a variety of ways. Experts believe that, by 2027, it will be able to produce a song that is indistinguishable from a new song by a given artist. Not only that, but the technology is expected to be good enough to deceive experienced listeners into thinking it is really by the artist it has been tasked to mimic. Just a year after achieving one music milestone, AI is expected to reach another. 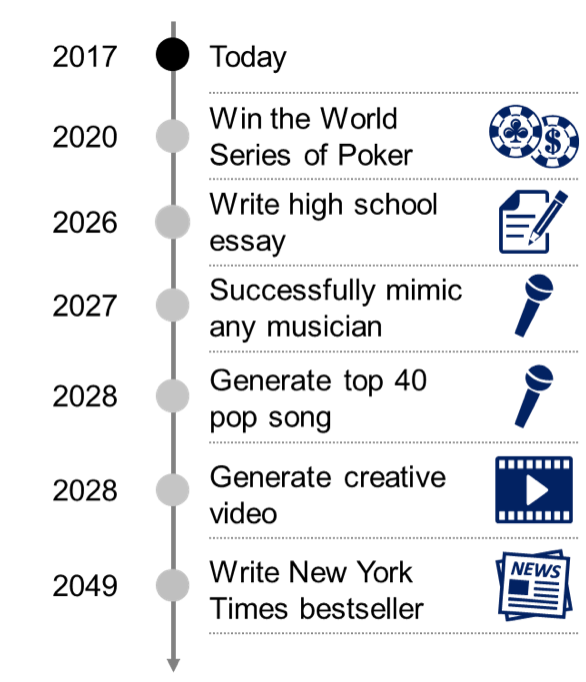 By 2028, it is predicted that AI will compose a song that is good enough to reach the US Top 40. AI can be used to identify narrative arcs in videos and predict how people will react to them. AI is also able to use a text input to generate a video, taking only 10 seconds to produce a first cut. AI could take a leap forward around the same time as its debut in the Top 40 charts. By 2028, experts predict AI will be able see a short video of a scene and then construct a 3D model of that scene good enough to create a new, realistic video of the same scene from a substantially different angle. In just over 30 years from now, AI is expected to write a novel or short story that will make it to the New York Times best-seller list. Change, positive and negative, is occurring at an exciting and dizzying pace. But some view existing AI governance frameworks as inadequate.Is the world ready for the challenges and opportunities AI will bring? It is more important than ever for society to think about how AI could impact all facets of daily life, and business leaders and policy-makers each have a role in supporting the proliferation of responsibly designed, developed and used AI technologies. It is essential to think about how AI could be used with societal benefit in mind.